Ready for a typical Badlands winter storm? Blankets, food, firewood, a book, and a bed is all it would take for us to hide out here at the Peaceful Valley Ranch in a winter storm. If only the National Park would rent these to people like you and us! The ranch and its cabins once were a showcase of the Theodore Roosevelt National Park. It’s used now by people who bring their horses to ride horses in the park. The two cabins stand empty at Peaceful Valley Ranch, but what a great place they would be to rent out for several days during a winter storm! They’re not for rent, though. We’ve been waiting for good ol’ fashioned Badlands winter to explore the Park — but it’s been fairly mild. We’ve hiked and caught the Golden Hour, but winter landscapes have been rare. This weekend, the last weekend in January, we got a bit of a glimpse of the leading edge of a storm as it came into the valley. Across the way, a couple of bull elk grazed in a valley. Above the elk, a coyote trotted to the edge of the overlook to see the animals below. Bison didn’t mind the cold. They just turned in to it, and let the snow and cold blow by while they kept eating. The entire loop of the South Unit of the Theodore Roosevelt National Park at Medora is not open. You can drive east river road, and go past Peaceful Valley ranch, Jones Trail, Wind Canyon lookout. Otherwise, nearly all of the park is off-limits to vehicles. You can walk in, or as we plan to do, cross-country ski or snowshoe in the very next chance we get. Both the South and North units of the Theodore Roosevelt National Park are open all winter, but the roads are closed part way into the park. You can hike, walk, snowshoe or cross-country ski into the park. You will get an experience that very few people ever have. If you go to the South Unit, afterward, warm up at one of the great eateries in Medora. We drove to Beach after the sun set to join a fundraiser for a movie house that the new owners are remodeling. We’ll tell you about that this week. Just add your email to the subscription list and we’ll send you a note when the article is published. 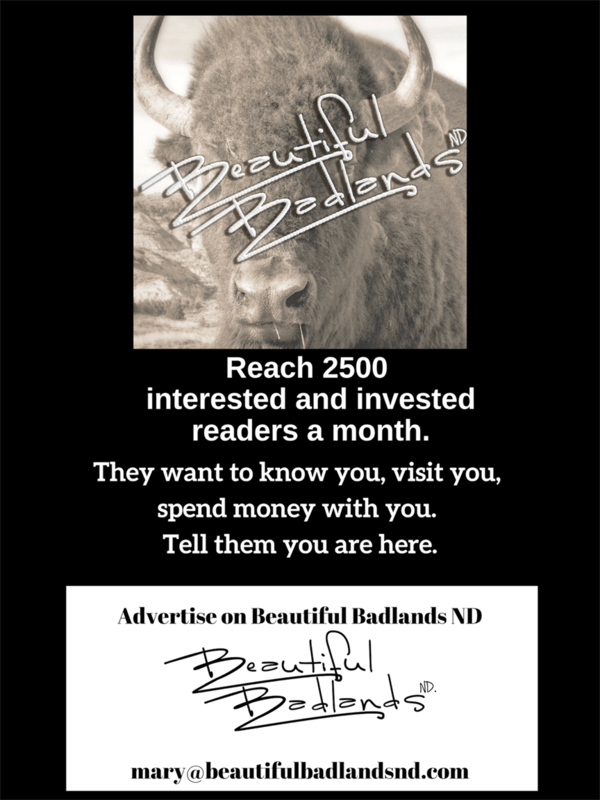 You’ll also get, for free, the twice-a-month newsletter of the Badlands. We’re booking speaking engagements to inspire and enlighten groups in North Dakota. One of those events is the hygge in Watford City in February. This summer, we get to share the beauty of the Badlands at a regional event in Medora. Stay Tuned!